Our 25 years of experience will help you create the landscape of your dreams. Owning property in The Twin Cities of Minnesota can sometimes feel frustrating because of the lumpy land. Sometimes it is easy enough to level out the ground using a bobcat, but more often than not it makes more sense to use a retaining wall. 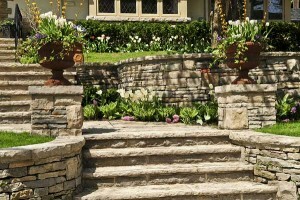 Minneapolis retaining walls are a great way to add both beauty and functionality to a lawn or garden space. They allow the property owner to fill in steep embankments in order to give access to otherwise unusable space on the property. They also present the opportunity to help make your property more elegant and clean looking. 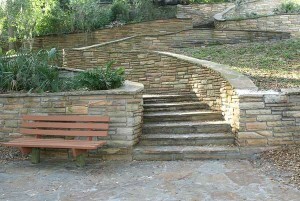 Retaining walls have many benefits; they add beauty, prestige and functionality to a property. Every time there is a steep hard to maintain slope that makes part of the yard unusable there is potential for a wall to go up. The wall will allow you to fill in the slope and increase your yard space. When people look at retaining walls they see a solid structure that makes a statement. Walls help to anchor your home and bring another dynamic element to your landscape. They also provide a great backdrop for some lower plantings or look beautiful by themselves. 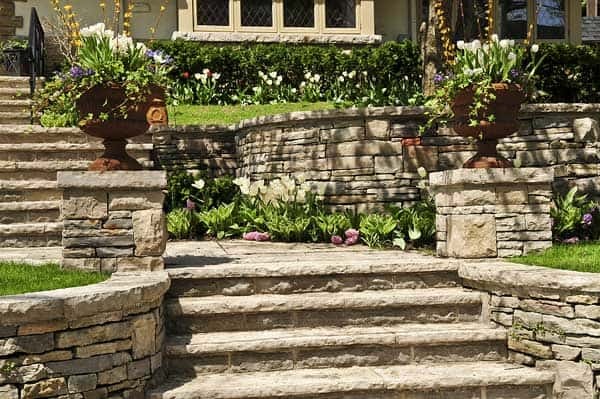 Not only are retaining walls aesthetically pleasing they also add resale value to your home. Adding a solid, functional structure to your home will help to create a stronger, more stable property. Retaining walls come in many different shapes and sizes. There are many different concrete block products that come in different colors and patterns. It is possible to get just rectangular blocks that go straight up and down, or you could get rectangular blocks that step back and give an angled appearance. There are random patterned concrete block wall options as well. Another great wall is created with natural field stone. These are slightly more expensive but create a wonderful natural look. Depending on what size wall is required will determine which product will work best for the situation. A retaining wall is a great way to reclaim land that would otherwise be unusable. It allows the creation of a nice level yard or planting bed. Retaining walls also provide a great back drop for plantings and add a unique and dynamic element to the landscape. If you live in the Minneapolis North Metro call: 612-369-6626 or South Metro 952-884-7255 and let us help you create the retaining wall system that tames your landscape grades.